A word of advice to anyone considering a translation or localization project, be sure to employ and then thank your Project Manager. Having a qualified Project Manager is essential to any translation and localization project. The Project Manager (or PM) does much to facilitate multilingual language projects and can save you a lot of time, stress and resources by ensuring that translation and localization projects run smoothly. Project Management is essentially risk mitigation.Translation and localization projects have lots of “moving parts” and lots of areas where something can go wrong. Project Managers take on the risks that come naturally with these projects, freeing you from unnecessary problems, pressures and anxiety, while improving both the process and the final outcome. What Does A Translation Or Localization Project Manager Do? A translation or localization Project Manager is responsible for overall schedule and budget performance, selection and management of the translation team, ensuring the quality of translation work, and serving as the primary point of contact for the client throughout the project. The Project Manager’s responsibilities include verification of the completeness of the source document at the start of the project, delivering status reports to the client and timely delivery of the document/file. Some PMs may also be responsible for negotiating rates from your translation team and for managing invoices. Here are 9 things that a qualified, professional Project Manager does to ensure the success of any translation or localization project. Communication gets complicated given the number of people involved with any translation or localization project. Typically, the person who needs the translation done is not the person or on the team of people performing the translation. Rather, there is the client (person requesting the translation or localization), the translator(s), the editor(s) and proofer(s), desktop publisher(s), engineers, all who must communicate to get the job done. A translation or localization Project Manager becomes the single, dedicated point of contact for interactions between client and translation and localization teams. A standard expectation from professional Project Managers is that they be available 24/7 to both you (the customer) and to the translation team in case any critical issues come up. Having a dedicated project manager gives you a person to address any questions, concerns or changes of scope that may come up during a translation or localization project. Every Project Manager should have a backup who is available to step in when the primary project manager is out sick or on vacation. A Project Manager ensures fast response to last-minute requests or unforeseen document changes. A good Project Manager will always take the time to understand your technical requirements, writing style and communication strategy. The Project Manager then becomes your representative to the translation or localization team, ensuring that all your requirements are adhered throughout the project. Since the Project Manager is the single point of contact, translators and editors do not interact and influence each other’s work. This important for any translation and localization project, especially those that involve back translation. A good Project Manager must preserve mutual anonymity between translators and editors. As with peer review of academic journals, mutual anonymity enables editors to comment frankly on translators’ work, allowing for maximum improvement in the final project. A typical translation project involves a minimum of three people, a translator, an editor and a proofer. When differences of opinion among these linguists arise, these differences are discussed with the Project Manager, who works to resolve these differences to minimize the chances of an error or omission in language or information. A good Project Manager may ask for your input at different stages of the translation or localization process and offer their own opinion where, in their judgment, it will be helpful. Do you need native language, in-country subject matter experts in 10 or 20 different languages and locales? Trying to manage this on your own can be complex at best and a nightmare at worst. Your Project Manager is the one who assembles your translation and localization teams no matter how many languages or countries are involved. Want to be sure that your translation is being handled by the best native language experts who are also subject matter experts and established professionals in the field related to your content? A Project Manager is responsible for assembling the translation or localization team with skills that are appropriate to the subject matter and style of the source documents. A qualified Project Manager ensures your project is being performed by optimal language and subject matter experts. In case we haven’t implied it clearly enough, communication is key to the success of any translation or localization project. Both you and the translation team need to know important bits of information throughout the course of a project. An effective Project Manager proactively communicates with you at each milestone to resolve linguistic issues and technical problems. For example, a translator may have questions as to how you want to handle measurements or particular jargon. While the Project Manager may make recommendations, they must communicate them, and ultimately give you the final decision making authority. In order to keep you from wondering what has happened with your translation project once you hired your translation team, a good Project Manager will provide customized reports and status updates throughout the project. Ever spend a sleepless night, fretting about if your translation or localization project will be completed in time to meet your critical deadline? A Project Manager takes on the responsibility for the timely delivery of your final translation. A highly skilled project manager is involved throughout the project and takes steps to ensure that deadlines are met without fail. A translation team may need to change its capacity according to demand. The fixed members are the Project Manager, editor and proofreader, whilst the number of translators at any one time can vary according to demand. A Project Manager manages and will scale up the team as necessary to meet the demands and keep your project on schedule. A Project Manager manages the translation process, tools and documentation throughout the course of a translation or localization project keep it successful. At the beginning of your project, a Project Manager will customize the process workflow based on your specific needs. They will also prepare and monitor quality assurance checklists to make sure any potential challenges will be remembered and addressed. A Project Manager will also maintain multilingual glossaries and Translation Memory specific to your projects as applicable to give you optimal cost and time savings. At the end of the translation or localization project, a good Project Manager will document each individual project history to evaluate it and make improvements for future projects. At the end of the project, a translation or localization Project Manager discusses with you all aspects of the project, and asks for your feedback. The Project Manager also evaluates the performance and quality of the deliverables of each individual translator and editor. A good Project Manager always performs a post-project assessment, where the Project Manager reviews the quality of the deliverables, summarize lessons learned, and may make recommendations for future process improvements. As you can see a Project Manager is vital to the success of any translation or localization project. You may be able to complete a multilingual project without a project manager, but the stress and uncertainty alone, make it not worth the effort. 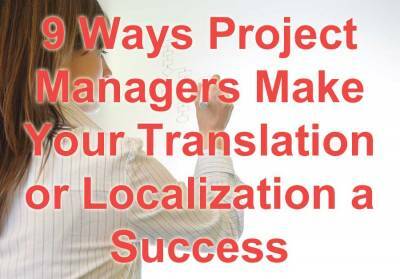 Please share what other ways Project Managers make translation and localization projects successful in our comments section below. Also, please don’t forget to like and sharing this blog socially using the buttons above.